Today’s big news is the opening of Metro’s first Bike Hub in El Monte. Similar to the Santa Monica Bike Center, it provides secure bike parking, along with basic parts, accessories and service to encourage riding the first and last mile, or more, when taking transit. Plans are also in the works for additional Bike Hubs at Union Station, the Red Line Hollywood and Vine station, the Culver City Expo Line Station at Venice and Robertson, and the Lankershim Depot in North Hollywood. The Hollywood Bike Hub has been promised for a long time, with an empty storefront marking the location in the W Hotel on Vine Street. Nice to see it’s finally happening. And this is what Metro’s new bikeshare bikes will look like when they hit the street next year. Although I was kind of hoping they’d be in color. New LA CD4 Councilmember David Ryu wants to hear from people in the district. 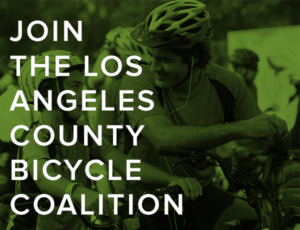 So if you live or work in CD4, take a minute to complete the survey and let him know we need safe spaces to ride and walk. Surly’s Marketing Manager address sexism in the bicycling industry — including within her own company — in the wake of the Sockgate blunder at Interbike. First Chris Froome, now Geraint Thomas pulls out of the world championships; last year’s champ is out, as well. In the wake of Tom Dumoulin’s epic fold in the penultimate stage of the Vuelta, VeloNews lists the top five cycling implosions. And yet, they also list him as one of five riders to watch. Today’s CrossVegas will be the first ever US stop on the cyclocross World Cup. And the Hollywood Reporter reviews the new Lance biopic, and finds it could have used a little something itself. Maybe a short film about two homeless LA BMXers will hit the spot, instead. Streetsblog’s Sahra Sulaiman strongly argues with Fix the City’s assertion that the bike and bus lanes contained in the new Mobility Plan are an attempt to steal their precious traffic lanes by people who have the luxury of riding a bike or taking the bus; she suggests that bikes and buses aren’t a luxury for underprivileged people in South LA. The problem with Fix the City and other similar groups is that they seem unable to look past their own convenience to consider the needs of others. 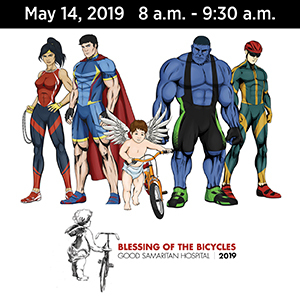 KPCC looks at the LA bike and pedestrian count conducted by the LACBC and Los Angeles Walks, which starts today, although the rain could adversely affect the results. It shouldn’t be up to volunteer organizations to keep stats the city and county should be collecting; hopefully the city is serious about keeping their own stats moving forward. The latest podcast from Streetsblog’s Damien Newton discusses fighting the bikelash with Modalcity’s Chris and Melissa Bruntlett. CiclaValley rides far from home in the Coachella Valley. But it’s still a valley, right? A section of the 405 Freeway will be named in honor of former Westminster police chief and city manager Mitch Waller, who was killed riding his bike somewhere else. An OpEd in the Desert Sun says plans for a 50+ mile bikeway looping around the Coachella Valley are silly, and instead of reducing pollution, it will increase it during construction. A Palm Springs police officer is honored for attempting to save the life of a 60-year cyclist who had collapsed from a heart attack. Sadly, while the officer may have saved the victim’s life that day, he died six days later in the hospital. 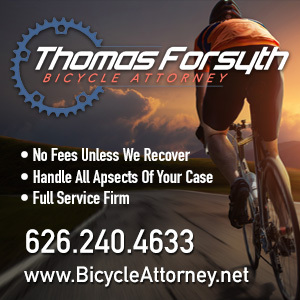 An informal survey from the local paper suggests most people in Tehachapi support bicycling; however, the CHP once again gets it wrong, saying it’s illegal to ride two or more abreast because bikes are required to ride far to the right. Actually, state law doesn’t even address the question of riding abreast, and the requirement to ride as far as practicable to the right doesn’t apply if the lane is too narrow to safely share with a motor vehicle. And once that standard is met, it doesn’t matter if you ride four abreast, as long as you all stay in the same lane. Cupertino makes changes to improve safety after a 15-year old student was fatally right hooked by a semi last year. That mustachioed San Fran Critical Mass cyclist who — allegedly — bashed a car with his U-lock has pleaded not guilty to a plethora of charges. The car was undoubtedly bashed; what’s alleged is that he’s the one who did it. San Francisco gets its first parking-protected bike lane. A suspicious looking man with muttonchops was busted with a pair of bolt cutters near a CSU Sacramento bike rack. Although if the police had just waited until he actually used them, they might have had a stronger case. Evidently, you have a biological need to ride your bike. And it can heal a broken heart, too. Even in bike friendly Portland, not everyone gets it. The Portland paper questions whether the city really needs bikeshare in advance of the system planned for next year, despite the success of similar systems elsewhere. Meanwhile, New York business owners say a three-week old bikeshare station is causing traffic jams and driving away business. No point in giving people time to get used to it or anything. Two Milwaukee men rode 1,400 miles from New Orleans to Minneapolis to have a beer with a friend suffering from ALS, aka Lou Gehrig’s disease, and meet with other sufferers along the way. 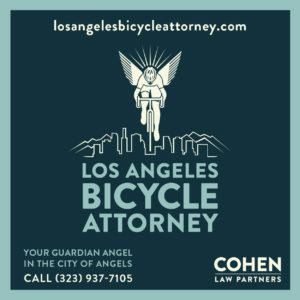 The same incurable disease recently took the life of LA bike attorney Howard Krepack. How can we expect most drivers to pass bikes safely when the police can’t even seem to manage it? A St. Louis cop plowed into a cyclist from behind, despite flashers on the rider’s bike and backpack. Illinois cyclists object to plans for an unprotected bike lane. Elkhart IN considers a road diet to improve their downtown shopping district. Naturally, an auto repair shop, which apparently doesn’t have a parking lot, objects. There are many good ways to use a bike. Throwing one onto a New York train track isn’t one of them. New York’s boulevard of death gets a new protected bike lane, and hopefully, a new name soon. No need to be on your best behavior once you leave elected office. A former North Carolina city councilman was arrested for DUI and hit-and-run after crashing into a bike rider. A new Canadian Ti foldie has become the most successful bike-related Kickstarter ever, raising nearly $1 million US with 16 days to go; they only asked for $90,000. Or you could just get a folding cargo bike. Evidently, Simon and Garfunkel were ahead of their time. A new British study of bicycling efficiency says slow down, you move too fast. Looks like they don’t take vehicular assault much more seriously in the UK than in the US, as a road raging driver who attempted to back into a bike rider loses his license for a whole year. At least he lost his license; even that seldom happens here. Brit motorcyclists are up in arms over raised armadillos installed to protect bicyclists, suggesting they pose a risk to that other kind of cyclists. Try on Levi’s Commuter series of bike clothes in Paris, Madrid or Barcelona, and send a selfie of yourself riding in San Francisco. A Canadian couple bring coffee culture to bike-mad Catalonia. A new study from Spain says male cyclists between the ages of 15 and 24 are more likely to be killed in collisions than adults, possibly because there are more of them on bikes and younger riders are more likely to take chances. And in other news, sangria is wet. Thailand is starting to take bikes seriously, with an additional 42 bike lanes planned for rural areas of the country, including a 115 mile bikeway. A tree falls on a car in Brooklyn because a sanitation truck ran into it, and they still manage to blame bike lanes. Bad enough we have to watch out for cars, now we have to lookout for boats, too; thanks to John Damman for the heads-up. 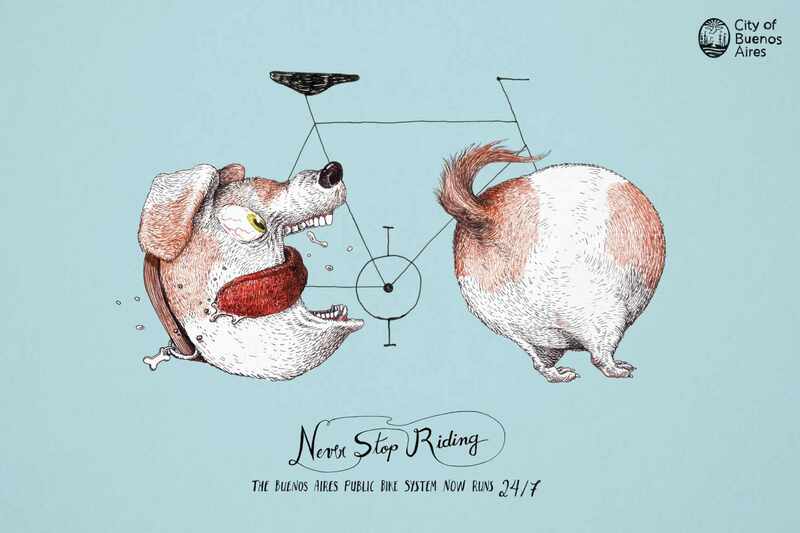 And a Buenos Aires bikeshare ad campaign wins advertising’s top award. The Buenos Aires bikeshare ad campaign poster is probably the craziest bike poster I’ve ever seen. Oh yeah… I should mention that I like it! I can’t quite decide if my biking personality fits the front “wheel” or the rear. I can report that the neighborhood council meeting regarding the Rowena road diet went well with support for keeping, or improving, the present configuration outweighing support to revert to the prior configuration by a large margin. The city engineers made clear that dangerous traffic conditions were the motive for the diet and that bike lanes were a sort-of residual benefit of the single lane configuration. This took most of the air out of the anti-bike contingent. Once the safety stats were shared, the issue seemed largely settled. Lastly, possible solutions to eliminating the cut-through traffic on parallel streets helped satisfy many concerned residents.